Posted on November 11, 2011	by Lou Murray, Ph.D.
Saute minced garlic in olive oil, add sliced chard with stems removed and saute until wilted. Add chopped parsley and a splash of balsalmic vinegar. Salt to taste. I should have added pine nuts, but I forgot. If you’re into amounts, rather than cooking by the seat of your pants, I used a pound of chard with stems removed, three cloves of garlic, 1 T olive oil, 1/4 C chopped parsley, and 1T basalmic vinegar. I used a couple of twists of Himalayan pink salt. I should have added 1/4 C toasted pine nuts. You can use lemon juice instead of vinegar, or use red wine vinegar, or add Parmesan cheese to top. We had the chard with lasagna. YUM! But getting yesterday’s harvest of chard, garlic and beets home turned out to be less than routine. I have a 14 ft x 20 ft plot at the new Huntington Beach Community Garden, about 7 miles from our house. I dashed over to get some chard at the last minute, miscalculating when the garden closed. I thought the outer gates were locked at 5. Uh-uhn. They’re locked at 4:30. Or at least they were yesterday. We have two gates, an outer one on the road leading to the garden, and an inner pedestrian gate with a key pad. I’m handicapped, so I drive in on the road to reduce the distance I have to walk. I park in the handicapped parking spot just outside the pedestrian gate into the garden proper. Long story short, I finished at 4:40 and my car was locked in. Arg! I knew the pedestrian gate combination, but had forgotten the combination for the outer gate. Thank goodness for cell phones. I called my loving husband and he called four board members before he found one at home who thought that she remembered the combination. Eureka! it worked. But then I had a heck of a time relocking the padlock (a series of interlocking padlocks on a chain that is too short) with my arthritic hands. Finally got it after much struggling. Thirty minutes later I was on my way back home. But on Wednesday, it’s a rush to get dinner on the table before my husband has to leave to teach a night class. And that’s why I forgot to add the pine nuts to the chard dish. It’s much better with toasted pine nuts. Give it a try. If you have a blog post about how you cooked with or preserved your harvest, visit (now who the heck is hosting Cook With It Thursdays?). Oh, yeah, it’s Robin at “The Gardener of Eden.” Check the Blog Roll to the right. 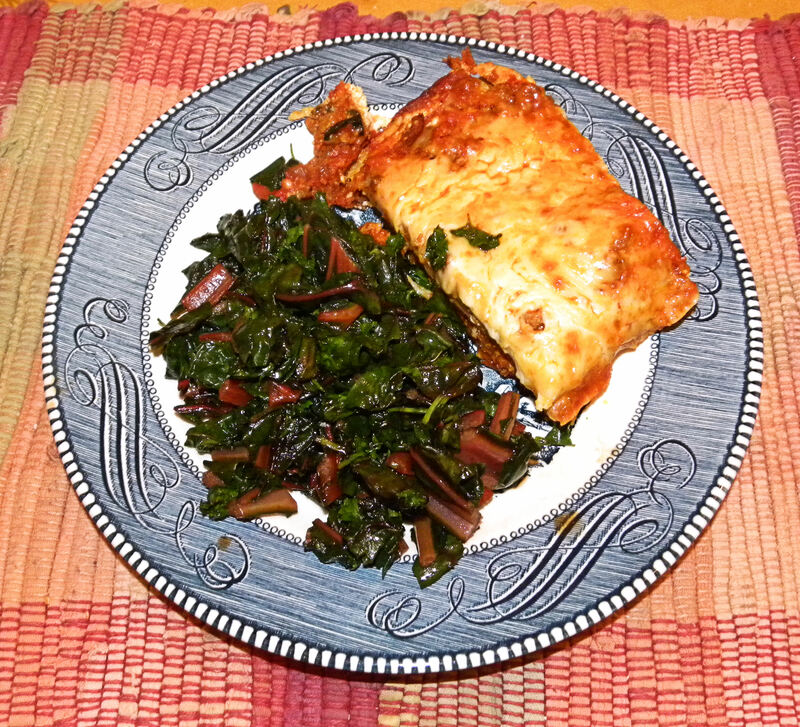 This entry was posted in Uncategorized and tagged chard, recipe, silverbeet, Swiss chard. Bookmark the permalink. It’s sounds like you cook the way I do…some of this and that! That’s a great recipe. I think it would also be good with other greens or a mix of greens like, kale, collards and chard. So glad that you were able to get out of the garden! Thanks for sharing and joining in! Hi Robin, thanks for stopping by. I think that the addition of collards and kale would be a very good one. Thanks for the suggestion. Clare, I buy pine nuts at Trader Joe’s. They’re not as expensive there as in the regular grocery stores. I cook exactly the same way and know that I probably drive some people nuts with my lack of measured amounts most of the time. This looks like a yummy chard recipe and definitely one I will give a try. I had a good laugh on the garden gate story. I am sure it was not funny at the time, but looking back at it must be good for a chuckle! Oh yes, thank goodness for cell phones and helpful husbands! Too bad whoever locked you in didn’t give a holler before doing so, uh, car in the parking lot, person in the garden… oh well, you managed to escape. I do a similar chard dish but without the parsley and with the addition of raisins or zante currants. Will have to try the flavor boost of parsley next time. Michelle, sometimes I use dried cranberries, pecans and rice wine vinegar, but I haven’t tried that with chard yet. I generally use kale for that treatment. Diana, I love BOTH kale and chard. Wouldn’t want to limit myself to just one of them. Glad you managed to unlock the gates so you can made some fresh home-cooking chards. I must have a go making this. Diana, it’s a good way to cook chard. I learned to do this decades ago from my old Sicilian landlord at the time, who was born in the 1890s. Today I took the liberty and posted the recipe you posted on my blog on 11/9. I should have asked your permission first, sorry. I never thought of adding parsley to my chard dish, must do so from now on, thanks. Norma, no need to apologize. I’m thrilled that you liked it. Yummy ~~ Gotta try this recipe when my chard and kale are ready to harvest. Mac, good luck with your chard and kale. Growing those cool weather crops in the high desert must be quite a challenge.